This version features A66 in the ‘Olympics for Melbourne 1996’ orange and grey livery, which the unit wore following the Bicentennial paint scheme. This model will have second pattern (Flexicoil) bogies, a plate over some of the grille work that was a feature of A66 in this livery, and an additional unique handrail adjacent to each of the nose doors. This version features A78 in the ‘V/Line Freight’ orange and grey livery. This model will have first pattern bogies, and five white reflectors down each side of the unit. The model will have the duplicated nose handrail and step modifications, which was normally only applied to V/Line Pass A Class locomotives, but were also fitted to this unit. The model will also feature additional steps to each cab. This version features A60 in the first series red, white and blue V/Line Pass livery, complete with ‘Sir Harold Clapp’ nameplates. This model will have first pattern bogies, the duplicated nose handrail and step modifications, and four white reflectors down each side of the unit. The model will also feature additional steps to each cab. This version features A70 in the first series red, white and blue V/Line Pass livery. This model will have first pattern bogies, and the duplicated nose handrail and step modifications. The model will also feature additional steps to each cab. This version features A81 in the ‘Freight Victoria’ green and yellow livery, complete with the white and green nose logos that were unique to this A Class unit. This model will have first pattern bogies, five white reflectors down each side, and additional steps to each cab. 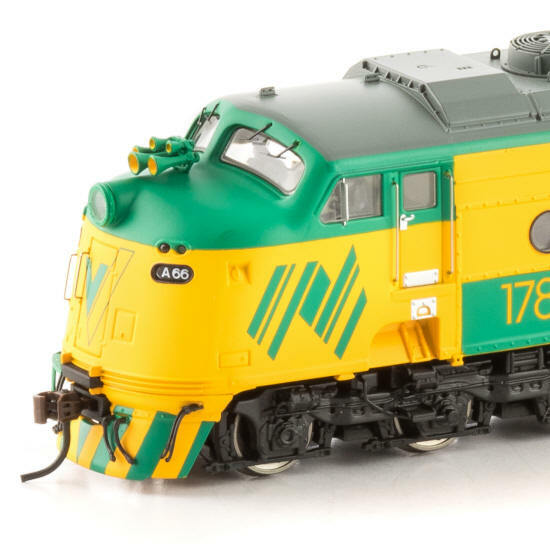 This version features A77 in the ‘Freight Australia’ green and yellow livery, complete with the white nose logos. This model will have first pattern bogies, five white reflectors down each side, and additional steps to each cab. This version features A71 & A85 in the ‘Freight Australia’ green and yellow livery, complete with green nose logos. A71 will have second pattern (Flexicoil) bogies and the inside of the whistles painted green, while A85 will have first pattern bogies and the inside of the whistles painted yellow. Both models will also feature the additional yellow painted steps to each cab. The A Class locomotives were a complete rebuild of a number of Victorian Railways (VR) B Class locomotives. B73 was the first B Class locomotive selected for rebuilding, and in the first half of 1982 this unit was transferred to Clyde Engineering’s Rosewater facility in Adelaide for work to commence. The rebuild program involved stripping the B Class units to a complete shell, and replacing the original GM 16-cylinder 567B engine with a new turbo-charged EMD 12-cylinder 645E3B engine, which would produce 2250HP available for traction. The original B Class D12 generator was replaced with an AR10 alternator, and EMD Dash-2 modular electrical equipment was added – the combined package resulting in an 18% increase in continuous tractive effort. The first rebuilt locomotive, A73, entered traffic in May 1984, and the last rebuild, A81, in October 1985. It was originally intended to rebuild all 26 B Class locomotives into A Class units, but following a decision to extend the build program of the brand new N Class units then entering service, the number of A Class locomotives rebuilt was truncated at 11. The A Class locomotives retained their original B Class numbers – the products of the rebuilding program were A60 ‘Sir Harold Clapp’, A62, A66, A70, A71, A73, A77, A78, A79, A81 and A85. At first, the A Class units were used almost exclusively on passenger services in Victoria, where their good acceleration and dynamic brake and quick turnaround times because of the double-cab arrangement made them ideal for such work. With the introduction of the Sprinter railcars in the earlier 1990s, the class began to see more use on freight services. 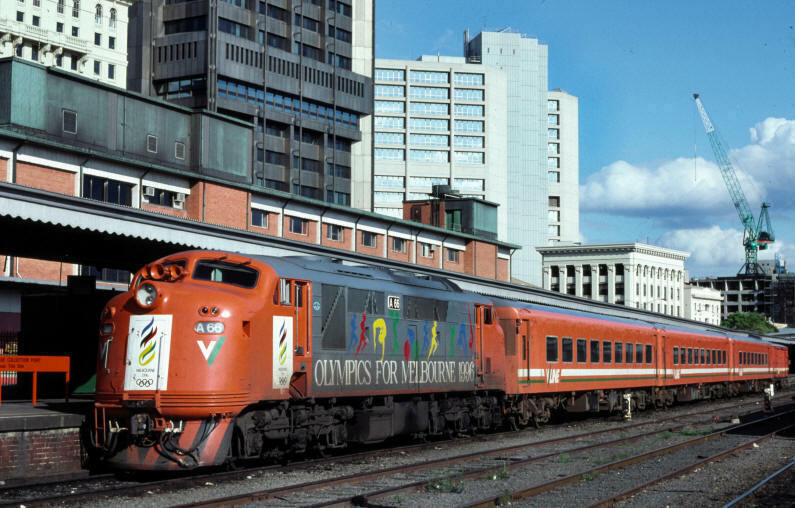 With the separation of services into V/Line Passenger and V/Line Freight in the mid 1990’s, the first four A Class units (A60, A62, A66 & A70) were allocated to passenger working, and the last seven A Class units to freight working (A71, A73, A77, A78, A79, A81 & A85). 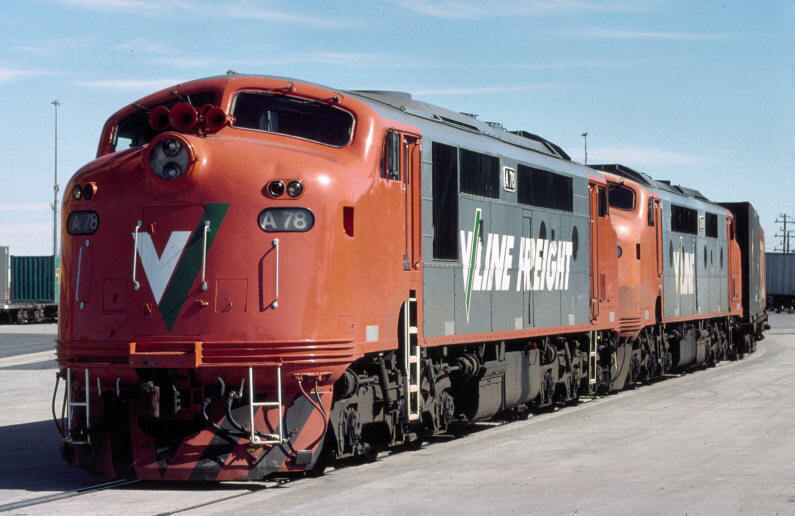 In 1999, V/Line Freight was sold off by the Victorian Government, and became Freight Victoria, followed a year or so later with another name change to Freight Australia. 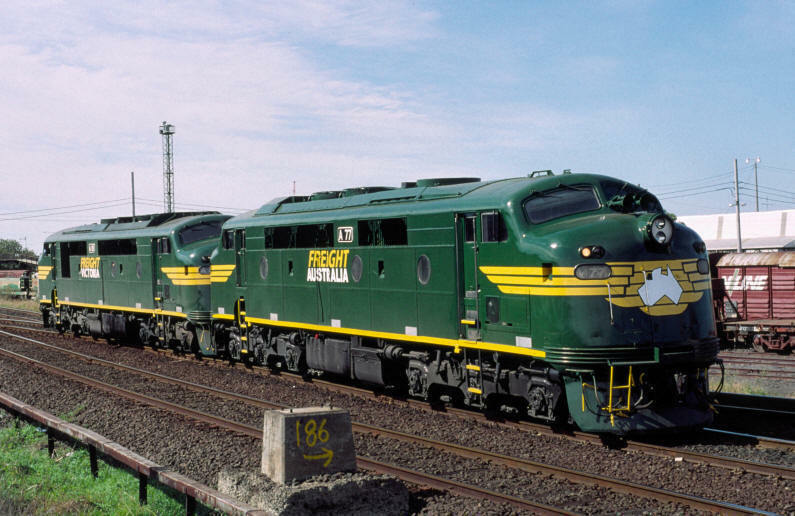 Very occasionally a green and yellow Freight Australia A Class can be seen on passenger services, and a red/blue/white V/Line Passenger A Class on freight services – such workings generally occur to cover a failure or locomotive shortages due to traffic demands. It is anticipated that the V/Line Passenger A Class units will be sold off some time in the next 24 months, as the new V/Locity railcars replace many loco-hauled passenger services once the Victorian Regional Fast Rail (RFR) infrastructure projects are completed. 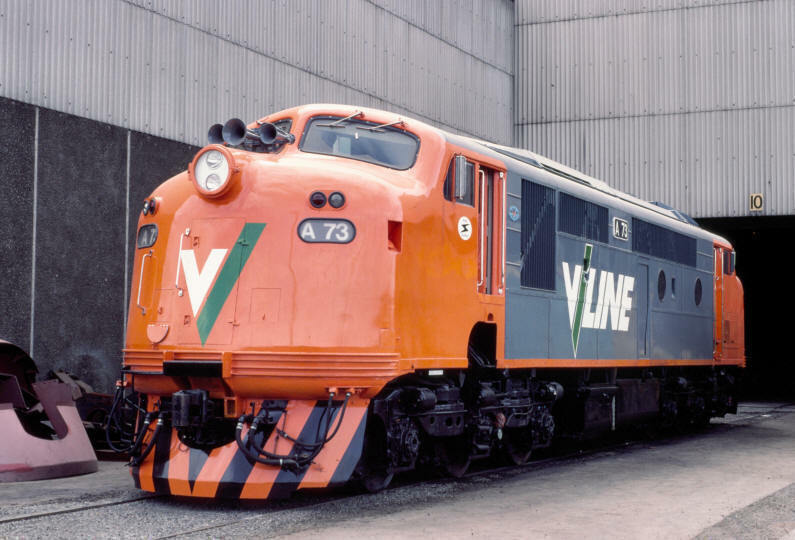 ‘V/LINE’ Orange & Grey livery, as the units entered service in 1984 & 1985 (A60, A62, A66, A70, A71, A73, A77, A78, A79, A81 & A85). 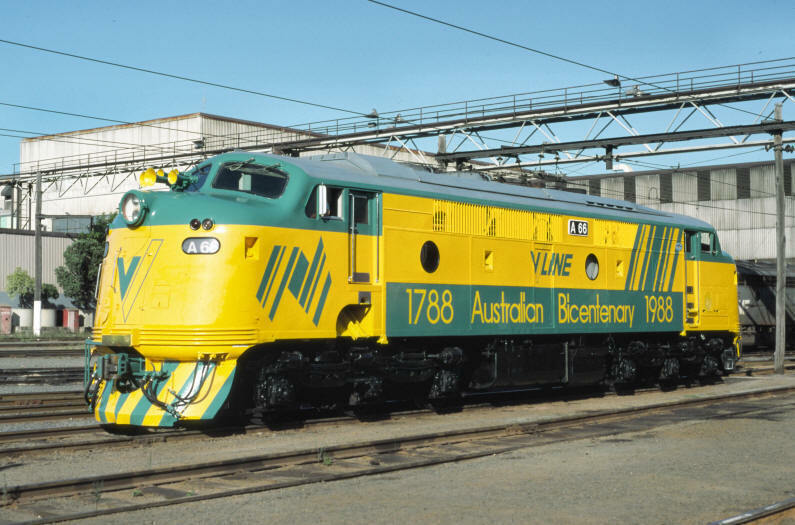 Australian Bicentenary Yellow & Green livery (A66 only). ‘Olympics for Melbourne 1996’ Orange & Grey livery (A66 only). ‘V/LINE FREIGHT’ Orange & Grey livery (A78 only). 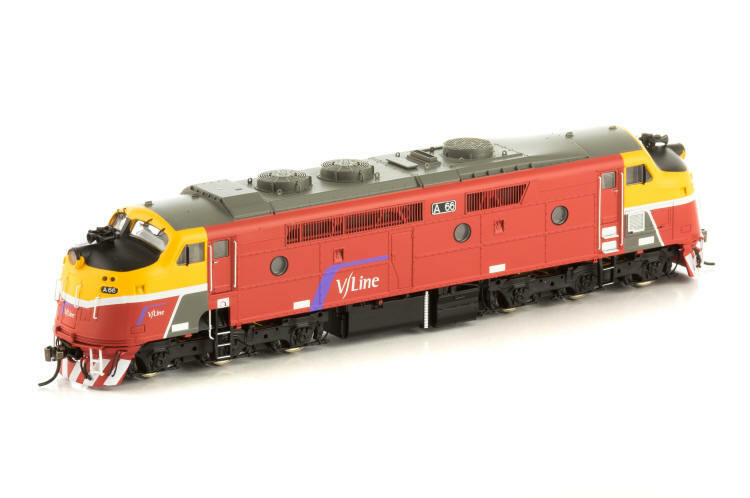 ‘V/LINE’ Passenger Series 1 Red/Blue/White livery (A60, A62 and A70). 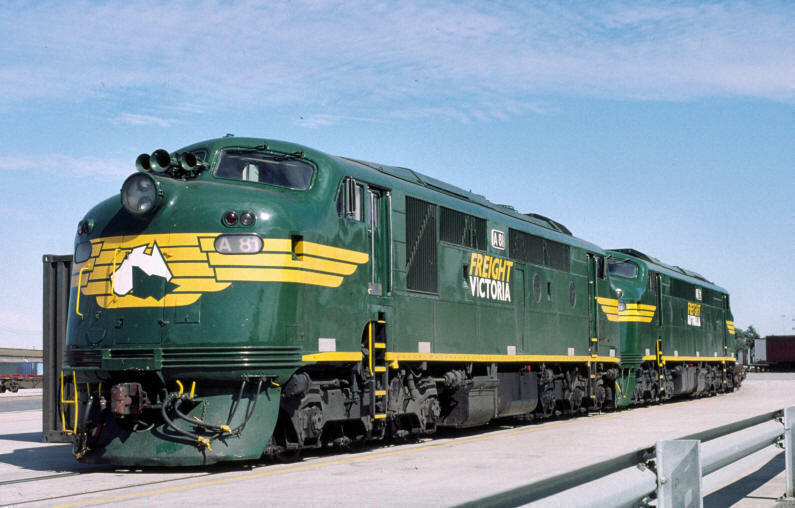 ‘FREIGHT VICTORIA’ Dark Green & Yellow livery, with white and green nose logos (A81 only). 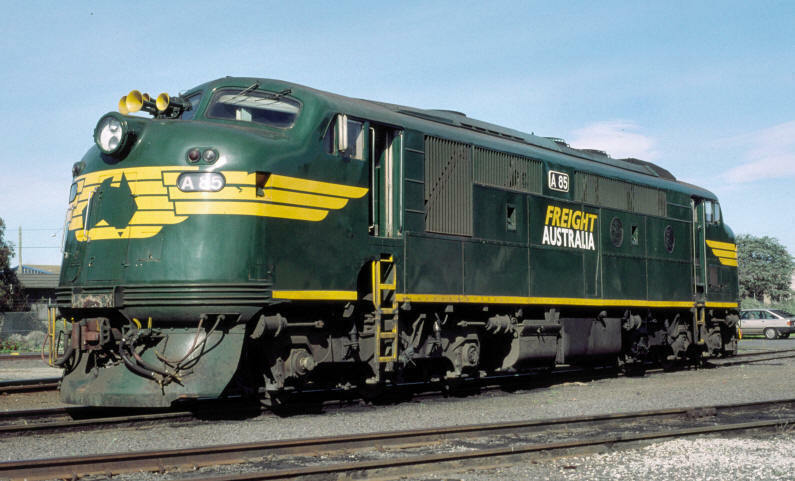 ‘FREIGHT AUSTRALIA’ Dark Green & Yellow livery, with white nose logos (A77 only). ‘FREIGHT AUSTRALIA’ Dark Green & Yellow livery, with green nose logos (A71, A73, A78, A79, A81 and A85). 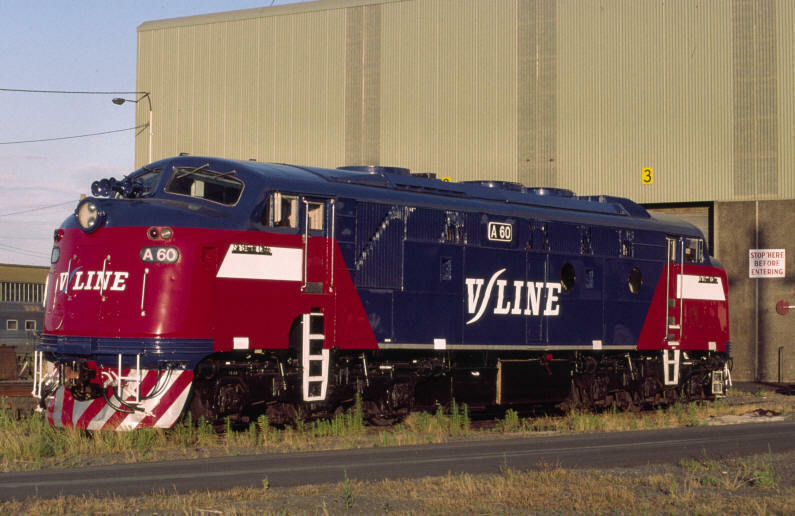 ‘V/Line’ Passenger Series 2 Red/Blue/White livery, with newer style ‘V/Line’ logos (A60, A62 and A66). Members of the A Class have had 2 different styles of bogies over their life. Class members have been fitted with either ‘first pattern’ cast bogies, or ‘second pattern’ (Flexicoil) cast bogies. A small number of body modifications have also been made to various A Class members. All class members had the cab side steps modified in the 1990s. Towards the end of its period painted in the Bicentenary livery, A66 had an additional handrail placed on each nose adjacent to the nose door. This handrail was removed a couple of years ago when the locomotive was repainted into the V/Line Passenger Series 2 livery. A60, A62, A66, A70 and A78 all have had the nose step and nose handrails duplicated on the driver’s side in recent years. A62 has recently had its staff exchanger openings semi plated over.